We offer training programs that are just what you need to take your first step to land an excellent and rewarding healthcare career. CPR classes Dallas TX is an 8-hour seminar offered to all individuals handling care with direct patient contact. 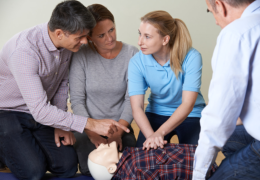 In compliance to the guidelines provided by the American Heart Association (AHA) that requires all healthcare staff to be able to administer Basic Life Support, this short certification program is conducted by the most qualified AHA instructors. Please direct all inquiries to 972-698-7792 should you have any.